The website of the Jerusalem Brigades, the military-terrorist wing of the Palestinian Islamic Jihad, recently posted pictures from the end-of-the-year party held at one of its affiliated kindergartens in the Gaza Strip. The children put on a display in which they pretended to be armed Palestinian terrorist operatives, Palestinian prisoners and Israelis. "When I grow up, I want to get on a bus with lots of Zionists and blow myself up in a suicide bombing attack and kill them..."
This according to the Jerusalem Brigades website and Hamas' PALDF forum. Among others, for years Hillary Clinton, as the top American diplomat, has "strongly" urged the Palestinians to remove such teaching from school curriculum. This demand stretches back 20 years, to the disastrous Oslo Accords. The Palestinians have never complied and by the way, I call on all American religious leaders, such as Lynne Hybels, Jim Wallis, and Shane Claiborne (I could name dozens more) to publicly repudiate this ghastly form of child abuse, xenophobia, and anti-semitism. I have toured the Meir Amit facility north of Tel Aviv, and seen the tragic school notebooks, drawings, and toys that show clearly the Palestinian youth are taught to glorify death and murder. Here is the point: until the international community gets serious about holding the Palestinians accountable, we will actually continue to move away from realistic chances for peace. Also, last month, specialists at West Point's Combating Terrorism Center released English translations of some documents captured at Osama Bin Laden's Pakistan hideout. 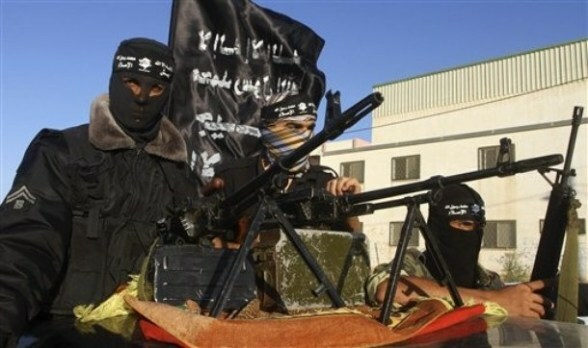 Among other things, the documents reveal that Al-Qaeda is coordinating with a Gaza Strip group called the Army of Islam. This chilling revelation tells us that the most lethal terror groups in the world are a direct internal threat to Israel. By extension, they are a threat to the rest of us (some of my local National Guard friends have operated in the Sinai in the past few years, so this news impacts very close to home). One of the documents reveals that the Army of Islam was asking Al-Qaeda leadership if it is permissible under Islamic law for them to accept operational funding from outside groups, including-and this perhaps for comic effect-the "infidel" Shi'ite state of Iran. Do you see? This Islamic version of the Hatfields and McCoys can certainly come together when working to kill Israelis and Americans. For context, you should know that the above document dates from 2006 and, according to the Israelis, the Army of Islam has "considerable operative capabilities," and two of its operatives were involved in the kidnapping of Gilad Shalit. The Army of Islam was also involved-knock, knock, knock, Lynne Hybels, Jim Wallis, and Shane Claiborne-according to the Hosni Mubarak government in Egypt of being involved in a terror attack on a Coptic church in Alexandria in 2011. Do any evangelicals who support the Palestinians decry Palestinian abuse of Copts? Aren't they Christians, too? Or do they count? Is anybody listening? The segment of Palestinian society that is radicalized is of course an existential threat to the rest of us, but let's be honest: they are also a threat to themselves. Can you imagine living in this kind of hate-filled environment? Can you imagine the psychological damage inflicted by these terror groups on their own people? I cannot. I can only grieve for them, reduced to living in that kind of emotional squalor. If the international community doesn't care about Jews, do they really care about Arabs? Why does our diplomatic corps pacify the Palestinian Authority/PLO? Finally, another hair-raising development is being reported by my friend, the Italian journalist Giulio Meotti, who wrote this week for Arutz Sheva that the campaign to erase Hebrew and Christian history is in full-swing by the Palestinians. This is one of the most odious efforts going on today in this arena, and the rest of us should be outraged. "At UNESCO's next session, which will run from June 24th to July 6th in St. Petersburg, the UN cultural body will assess the Palestinian request for admission of the "Birthplace of Jesus: Church of the Nativity and the Pilgrimage Route, Bethlehem" to the list of world heritage sites. "The Christian shrine will become Palestine's first world heritage site. "Next in line is the Hevron's Cave of the Patriarchs." Where is the outrage? Since Yasser Arafat arrived in Israel two decades ago, a systematic effort has been underway to remove Jewish history from the land. This absurd reality has been allowed to continue (Bill Clinton heard Arafat deny there were ever Jewish temples on the Temple Mount, and the man who had sat under the Southern Baptist teaching of W.O. Vaught Jr. no doubt just sat there and bit his lower lip). "The Palestinians are trying to erase any trace of Jewish history in Judea and Samaria. Yet a few days ago Israeli archaeologists discovered a seal bearing the name "Bethlehem" in ancient Hebrew script from First Temple times, one of the most important pieces of physical evidence supporting the Jewish claim to the town before it became revered as the birthpace of Jesus." Are Claiborne, Bob Roberts (senior pastor, NorthWood Church, Keller, TX), Joel Hunter, and Tony Campolo aware they are being used as stooges by the Palestinians when they appear at Christ at the Checkpoint? Do they realize they are part of a diabolical effort to erase their own religious heritage? Don't you find that profoundly ironic and sick? Mustafa Barghouti, a so-called moderate in the Palestinian authority, said in 2009 that Jesus "is the first Palestinian who was tortured in this land." What in the world has happened to our world? Truth is lie and lie is truth. Our own Christian leadership in America cannot discern good from evil. Meotti also makes the following salient points (the entire article can be read here. "There is a growing global network of Islamophile Christians with organizations like Amos Trust, Christian Aid, Sabeel, Living Stones, World Council of Churches, and influential bishops and pastors like Mitri Raheb, Stephen Sizer, Elias Chacour, Naim Ateek and Michael Prior. "It doesn't matter that Jesus was not born a Christian, but a Jew, and that Bethlehem was a Jewish town in Judea, not a Muslim one-because there was no Christianity before his death and certainly no Islam for hundreds of years after his death. "It doesn't matter that the Palestinian Authority persecuted Arab Christians in its midst." You know what? I think he's right. I don't think these things matter to those who let themselves be used by Jew-haters and Christ-deniers. That's the answer. Which is why it is critical to reach those who don't yet understand, or who are on the fence. When I attended the Evangelicals for Middle East Understanding conference in California last fall, the only speaker I felt who lives in reality is Botrus Mansour, director of Nazareth Baptist School. Mansour would certainly not agree with me about many things, but he did say something profound and enlightening. He said there are two kinds of people in the world: those who believe man is inherently good, and those who believe man to be inherently bad. He's spot-on, of course. What we have to hope and pray for is a growing awareness that the latter condition is the accurate one.